Richard C. Atkinson’s achievements as scientist, educator, and passionate advocate for American science have earned him international recognition and countless honors, as well as election to the National Academy of Sciences, the Institute of Medicine, the National Academy of Education, and the American Philosophical Society. His career reflects an extraordinary ability to combine interests and insights that span conventional disciplines and redefine traditional boundaries. At Stanford University, where he held appointments in the Department of Psychology, the School of Engineering, the School of Education, the Applied Mathematics and Statistics Laboratories, and the Institute for Mathematical Studies in the Social Sciences, he quickly attained international stature as a rising star in cognitive psychology, specializing in memory and cognition. Atkinson is one of three to five key researchers who developed the field of mathematical modeling in psychology. His work established the validity of mathematical modeling as a powerful tool for illuminating complex cognitive phenomena. Atkinson produced seminal research contributions in Word Recognition and Search Processes in Recognition Memory, each of which has since blossomed into an important subfield. In a groundbreaking collaboration with Patrick Suppes, Atkinson created one of the first computer-controlled systems for teaching reading to elementary-grade children. His scientific works have been translated into nine languages, including a Russian translation of his collected papers on human memory and cognition. Atkinson’s contributions to national science policy began in 1975, when he accepted a temporary appointment as deputy director of the National Science Foundation. It became an eventful five-year tenure, three as director under President Jimmy Carter. Atkinson guided the agency through what one commentator called “a rebuilding from the ravages of the Nixon anti-science era,” skillfully defending peer review and basic research against Congressional and media attacks. At the same time, he revealed a gift for translating principles and convictions into enormously productive programs and policies. The first memorandum of understanding between the People’s Republic of China and the United States, an agreement for the exchange of scientists and scholars, was negotiated and signed during his directorship. Convinced that rebuilding the close pre-war relationship between industry and research universities was crucial to the future of American science, Atkinson took four steps that have had far-reaching consequences: establishing the Industry-University Cooperative Research Program to encourage collaborative research between private companies and universities; encouraging analyses of scientific R&D’s influence on economic growth; elevating engineering to a full directorate at NSF; conducting an analysis of the technology-transfer process that helped lay the foundations for the 1980 Bayh-Dole Act, which transferred intellectual property rights in federally sponsored research from the U.S. government to universities. 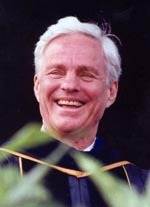 The same innovative intelligence marked his service as chancellor of the University of California’s San Diego campus (1980-1995) and president of the University of California System (1995-2003). The single best example of Atkinson’s presidential leadership was his challenge to the aptitude-based SAT I, for seventy-five years the dominant college-entrance examination in the United States. In 2001, Atkinson announced he was recommending that the University of California eliminate the SAT I as an admissions requirement. His brief against the SAT, the product of his experience as a cognitive scientist, psychometrician, and founding chair of the National Academy of Science’s Board on Testing and Assessment, was precise, scientifically based, and supported by four years of data involving test scores of 78,000 entering UC students. The SAT I, he argued, was unfair to students because it is grounded in “ill-defined notions of aptitude.” Atkinson’s public challenge was an act of intellectual and political courage that kindled a long overdue national debate on the use and misuse of standardized testing and a nationwide movement toward achievement tests. He continues to serve the nation as chair of the National Academy of Science’s Division of Behavioral and Social Sciences and Education. Richard Atkinson is a pioneering scientist and visionary leader of American science in the tradition of Benjamin Franklin and his devotion to “useful knowledge”; Vannevar Bush and his vision of universities as the heart of the American research enterprise; and Frederick Terman and his conviction that putting knowledge to work in society constitutes a vital public service. Few scientists of Atkinson’s stature have gone on to make contributions of the highest order in science policy, education, and public understanding of science and technology. Even fewer have served the cause of science so variously and so well. Would you like to honor Dr. Atkinson? It’s not too late to have your name added to the list of donors! You can make your donation to Dr. Atkinson’s In Honor Of… campaign at anytime.